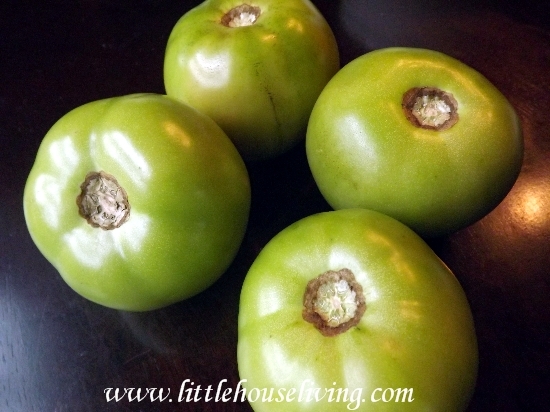 Do you have some green tomatoes sitting around from your garden that fell off the vines? Maybe where you live the frost has already come and you have green tomatoes from pulling your harvest. Well, today we are going to show you how to make Green Tomato Pickles! 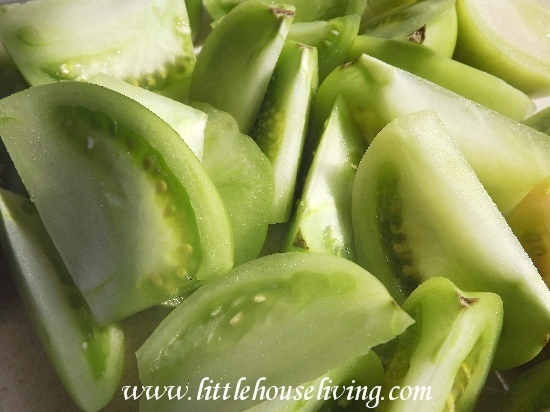 Green tomatoes are great to use for pickling because they are firm and tend to be easier to cut and work with. With the addition of spices and hot peppers of your choosing, this recipe for pickling green tomatoes adds a little zest to traditional pickling methods. 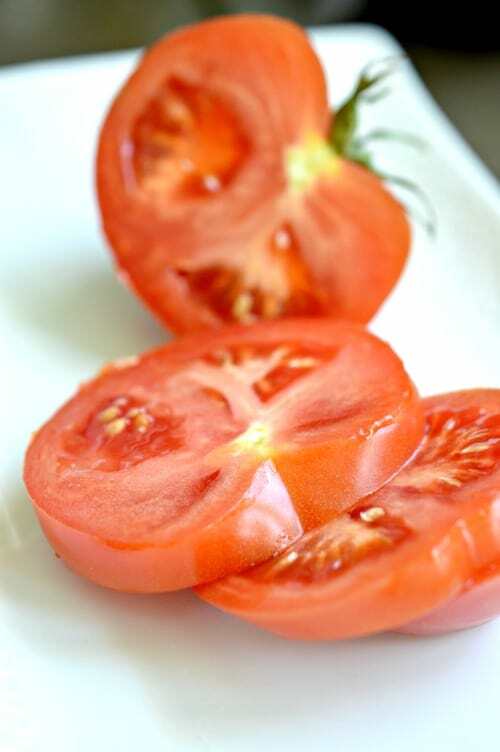 Cut the brown ends off the tomatoes and slice into 1 inch wedges. 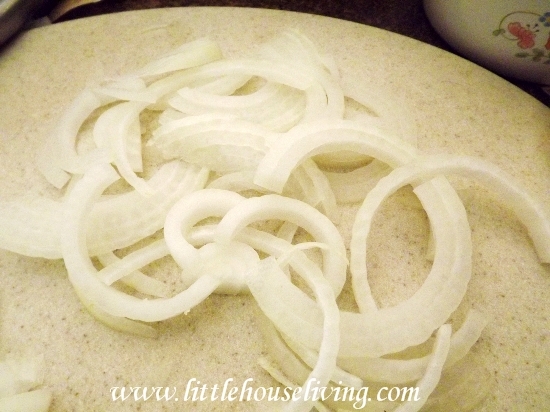 Cut the onion into thin slices and combine with the tomatoes into a large glass bowl. Sprinkle the pickling salt over the tomatoes and onions and mix well. Cover and allow the vegetables to sit in your refrigerator for at least 2 hours, preferably overnight. Remove the vegetables and rinse. In a large pot combine the cider vinegar, water, turmeric, celery seed, mustard seed, and sugar. Bring the mixture to a simmer over low heat. 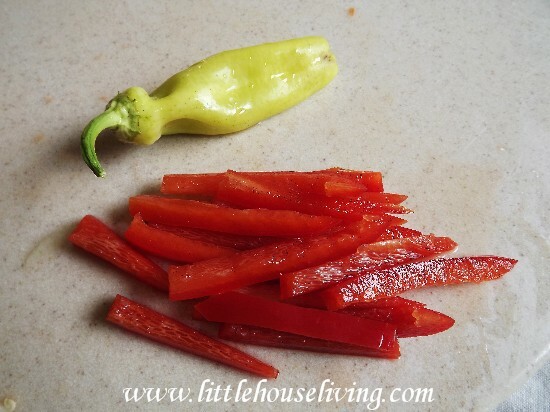 Start with clean, sterilized jars and begin filling them with a few slices of the peppers. (How much you add to your jars will vary depending on how much ‘heat’ you’d like to add!) Pack the jars with the tomatoes and onions. Leave about a ½ inch from the top of the jar. Using a funnel, pour the hot vinegar and spice mixture into the jars. Check for air bubbles and try to release them by gently tapping the jars, or by using the end of a clean kitchen utensil. Wipe the rims clean and securely attach the lids. Return the jars to a hot water bath for 15 minutes for pints or 20 minutes for quarts. 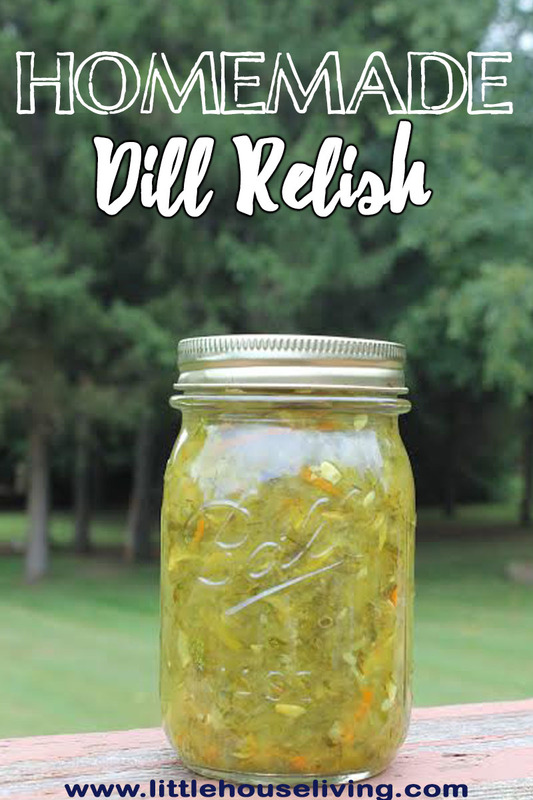 Makes 2 1-quart jars or 4 pints. With all pickles, it’s best to wait at least 6 weeks or so before you decide to indulge. Otherwise, they may not have that pickly taste. What’s next? How about this Zucchini Relish Recipe? 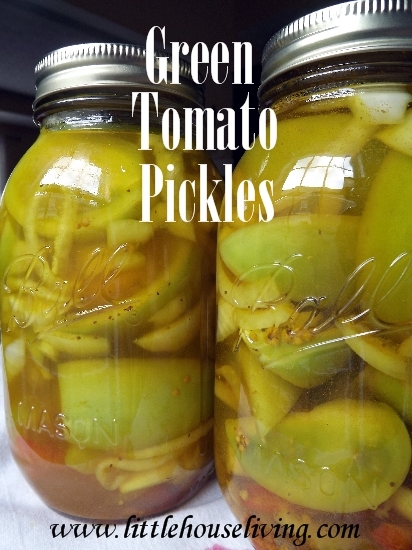 Have you ever made green tomato pickles? What does your family think of them? great job!!! My hubby would love these. Yum! My hubby would love these. This is going on my to-do list! HI, The last couple of things I tried to pin to Pintrest would not take. They said the image was too small. Not sure what that means, but I don’t have trouble with any other sites. Just a heads up. Have a great day! Hmm that’s weird, we haven’t had that error before. Maybe Pinterest is being glitchy today? Hi Merissa – last weekend I decided to make a huge canning run of end-of-the-season tomatoes from our local farm, but when I got there all they had were green tomatoes (the very last of the season tomatoes). After some frumping around I bought them anyway with no idea what to do with them. 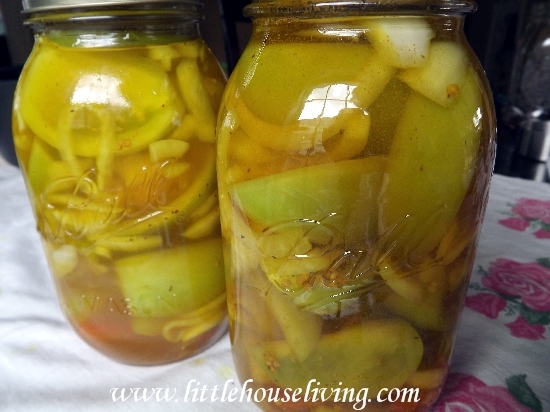 That afternoon I found your recipe for Spicy Green Tomato Pickles and it was just perfect! I love how you give the ingredients for 2 quarts, that made it easily scalable since I had about 30 pounds to process. They are beautiful and I can’t wait to share them with our family. Thank you so much for sharing this great way to use the whole harvest! These look delicious. My family loves pickled green tomatoes, especially with fried catfish. I haven’t made them, but now I want to. Thanks! Looks yummy. I have never made green tomato pickles. Thanks for sharing at the party! Pinned & shared. Can I use any leftover vinegar mixture to do another batch? I am in the middle of making the brine for these pickles. Are the 3 Tbsp of pickling salt added to the brine? No, the pickling salt is to be sprinkled over the tomatoes and onions before they rest for a few hours. Do you mix the tomatoes with the brine and simmer or just the liquid mixture is brought to a simmer and poured over the tomatoes in the jar? Sorry, that’s not clear in the recipe! You will pour the brine over the tomatoes in the jar.